First of all, international auto shipping is VERY common. So, you don't need to worry about finding dependable help to get you through this particular specialized shipping need, but there are many ways to dice this apple, so let me walk you through a few scenarios to ensure you're ending up with the best rates available. Roll on roll off service ("roro") is basically having the automobile loaded onto the vessel without being placed in a shipping container. The vehicle is driven onto (rolled on) the vessel at the time of loading and driven off (rolled off) the vessel at the time of unloading. With containerized service, the vehicle is loaded inside a sea container which is then loaded onto the vessel by crane. Ancillerary charges for CONTAINERIZED shipping: You can expect to pay less in ancillary charges for roll on roll off service than they would for containerized service. They include, but are not limited to: auto loading, blocking, and bracing, drayage, port fees, trans-loading fees, and warehouse fees. Auto loading, blocking, and bracing: Automobiles have to be loaded inside the ocean container in such a way so as the cars will not move around inside the containers during transport and risk getting damaged. This requires expert warehousing services applied by professional packers and loaders who have proven histories of reliable auto loading that eliminate or greatly reduce the risk of damage during land and marine transport. Remember, the container is going to be transported to the port by truck, lifted up many feet into the air by crane at the port as it is shuffled around and then finally loaded onto the ocean vessel. The ocean voyage isn't always smooth sailing with sea water splashing around all over the place and the boat rocking dizzily on the rough waves. To prevent and eliminate any risks of damage, vehicles need to be lashed and strapped, and solidly secured, blocked, and braced to the container so that they will not move. Drayage: The container, once loaded with the vehicles, has to be transported to the port so that it can be loaded onto the boat. This requires the services of a trucking company that has the capability to carry ocean containers on truck chassis to and from the port. 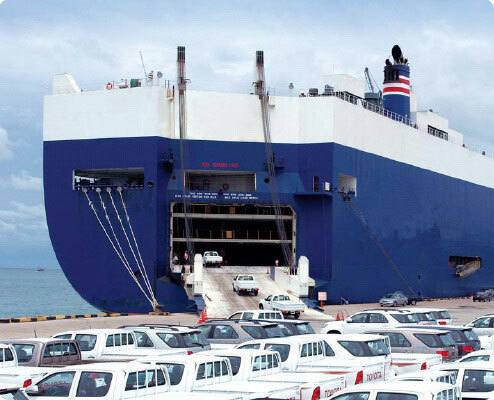 In the case of a roro shipment, the shipper could merely drive his vehicle to the port where the car will then be driven onto the boat, or “rolled on” -to the boat. Port fees: Oakland has them. Los Angeles has them. And they represent two of the biggest ports on the West coast. Trans-loading and warehouse fees: Not as commonly applied as the above stated ancillary charges, they are still fees that can be charged given certain circumstances. Roll on roll off services are priced by volume and gross weight, so a prospective customer will need to be able to provide as much detail about their vehicle as possible, particularly the year, make, model, curb weight, and dimensions (length x width x height). Most common vehicles fit inside of sea containers, whether they be 20 foot or 40 foot containers. Given that the inside length capacity of a 20 foot container is nineteen and a half feet, two small economy vehicles can fit inside. This is where the advantage of containerized shipments of automobiles manifests itself. Since containers are priced per unit of the container rather than the volume of the cargo inside, the savings are quite enormous when shipping multiple small vehicles which would otherwise by priced by the total volume in cubic meters of each and all vehicles if shipping by roro. In the case of fully assembled heavy machinery, such as construction vehicles, a conventional, fully-enclosed container is usually not large enough to accommodate the oversized dimensions of such cargo. Flat rack containers and roro services are often your best option. Roll on roll off service is less common than containerized service, and there are much fewer available trade routes for them, so from a feasibility and practicality stance, containerized may be the way to go. For example, if you want to ship an automobile to Africa, you may desire to use the roro service to save money on extra surcharges that would be applied to containerized service. However, these services to Africa are very few and far in between, because there simply isn't a big demand for it, so logistics may prove to be less than desirable in this particular trade route. Containerized shipments of vehicles, though sometimes more expensive than roll on roll off shipments because of the extra fees involved, are much more common and it is much easier to find suitable trade routes. Whether roro or containerized, finding the best shipping rates when transporting your automobile(s) overseas does take some guidance, but will pay off in the end.